It sure is warm here......Ofta, hitting the high 80's~if it wasn't for the humidity you actually would enjoy being outside bit more. We did spend yesterday at the lake which was so much fun! The little ones just loved it! 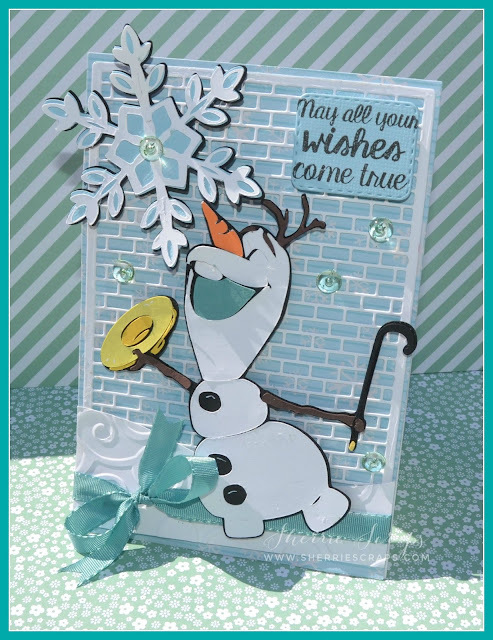 Today I am sharing a fun card and hope you enjoy it as much as I did making it :) I just received the "new" Disney Frozen cartridge in the mail and couldn't wait to tear into it. I know I will use it a lot since Arya is a BIG fan of Frozen. There are some cute, cute images and hoping to create some fun Christmas projects for her. 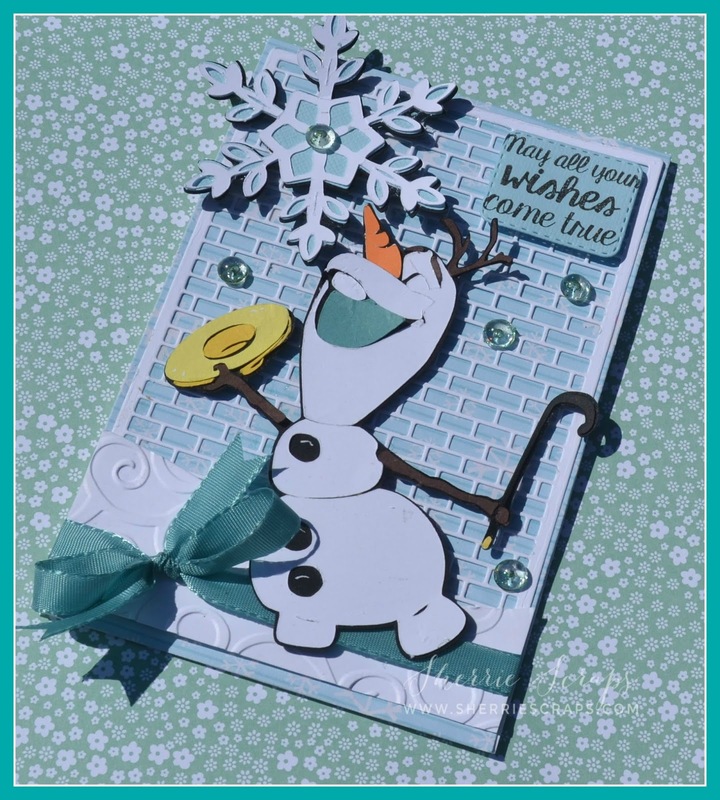 The snow is then created using My Creative Time's~Fun Stitched Edges die and embossed with the Divine Swirls folder. Olaf is cut using the Disney Frozen cartridge at 4 1/4 and the snowflake at 2 1/2. After piecing them together, I used foam adhesives for a little dimension. I just love Olaf~he is so happy! I finished with a sentiment from Craftin Desert Diva's~Enchanted Wishes and stamped onto a square using My Creative Time's~Square Stitched Goody Die.I tied on a pretty bow using ribbon from SU and yummy skittles from Double Click. Fabulous card, Olaf is so cute! I love that brick background and the embossing! Hope you are having a great Sunday! 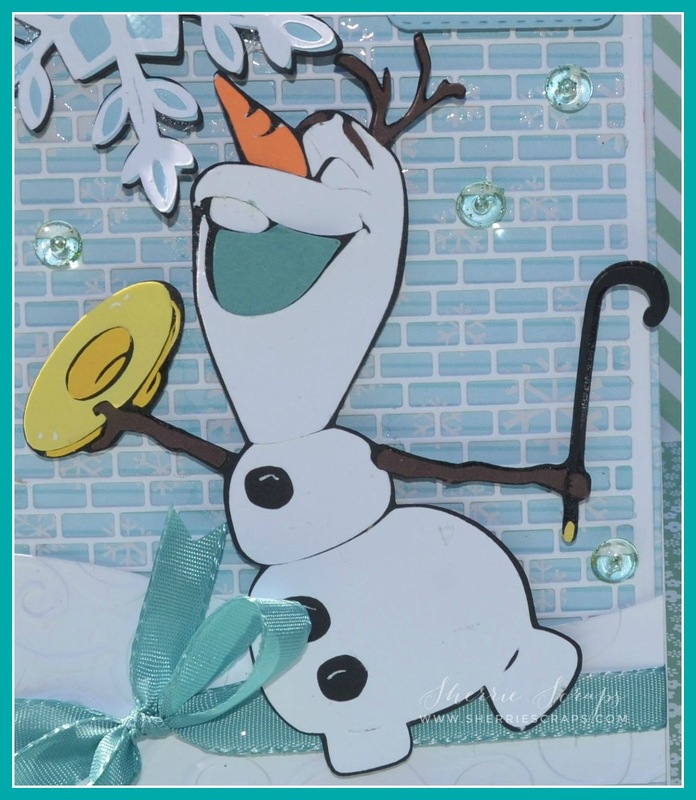 I just love your card and the way you decorated it, I love Olaf you did a great job. Oh boy, I am looking forward to seeing what else you create with this cartridge. Oh my gosh, this is the cutest card, Sherrie!! Olaf is so adorable!! I've never seen Frozen but this makes me want to!! Love, love how you used the Brick Background die (I'd love if you'd share this on the Die-Versions FB page here: https://www.facebook.com/DieVersions). Each detail is perfect!! It's wintery and fabulous and makes me smile!! I can't wait to see what else you create with this cartridge!! I'm not kidding - I'll probably end up seeing the movie because of your projects!! OMGoodness, how cute is this card, love all that texture and demension, super adorable, love it! You have certainly built a wonderful winter-y scene for Olaf to be in!! So perfect and all your details are amazing!! Love the sentiment and just the whole card is super COOL!!! So very glad you joined us for the Disney - Believe in Magic Challenge over at DoubleClick!! We are so glad you linked up with us!! Hope to see you again soon!!! OMG I love it!!! Olaf is my FAVORITE from the movie! I HEART him!!! This card is gorgeous! Arya will LOVE this and anything you create from this cartridge. I really want this myself. My niece and my daughter love Frozen, more so my niece but yeah... this will come in handy to make all their Christmas gift wrap, cards, etc. SO cute! Cannot wait to see lots of other projects that you make with this cart. Glad you had a great time at the lake. Hoping you took tons of photos to scrap! Such an awesome background! I need to check into this die, I love it! Looks like a great cartridge! Kids are back to school tomorrow so I am crazy trying to get them ready! Thanks for joining us over at the DoubleClick Skittles Challenge! DT Member Carri~Abusybee Skittles! I love this wonderful card!! That Olaf is such a cutie! You did a fantastic job with all the layers! I love that brick die....so neat!! I always enjoy all your projects! Fabulous!! Super fun card Sherrie! Live Olaf and love Frozen! Oh so wonderful ! So super full of cuteness ! Awww- this is darling! I bet the little ones go crazy for the Frozen images : ) The brick die is so neat too- very cool look for the background. The sequins are a perfect accent. So glad you had fun at the lake- I am West of Chicago, and we have had tons of rain and not many days for sunning, so trying to enjoy the days even with the humidity...... Oh- and Thanks for joining in the Sweet Stamps snowflake challenge! Better keep Olaf in the house so he doesn't melt! He is adorable! Hope there is a Mrs. Olaf in part 2. So adorable!! Thanks for joining us at Die Cuttin' Divas this week. OMYGOSH!! This is sooooooooooo AWESOME!! I LOVE LOVE LOVE Olaf!!! He's the BEST!!!!!!!!!!!!! Isn't this heat something else! I got into my car this afternoon and it was 104 degrees! It did cool down to 98 once I started moving...lol! Olaf seems to be holding up in the high temps okay -he sure is a cutie. And, I LOVE that background, how fabulous. Beautiful card my friend - stay cool! Me again! Couldn't get enough of Olaf! Thank you for joining our “Christmas in July” Challenge this week at Die Cuttin’ Divas. Just can't get enough of Olaf! Thank you for joining our “Disney or Mouse” Challenge this week at DoubleClick Skittles. How cute. I love the background. Have a great day. Simply fabulous card! I love Olaf, he is just about the sweetest, cutest snowman ever! What a fabulous card. Thanks for joining us at DoulbeClick Skittles! Oh, I saw this over at CDD and loved it! Who doesn't love Ofaf??!! Superb job on this fun, pieced project. Thanks for joining the DoubleClick Skittles Challenge. so so fun and heck-a cute!!! Oh my gosh.....your card is fabulous Sherrie!! Such a cute image and I love all the layers, especially the brick die ( think I need to go shopping) Have a great week! This is so ADORABLE!!! I just LOVE Olaf!! I absolutely love the fun scene!! Of course he is a cutie patootie!! This is soooo cute! Even though they are teens, my girls loved Frozen and Olaf is their favorite! They'd LOVE this! Sherrie ~ Oh my word this is seriously AMAZING and so darn CUUUTE!!! I too am with you about winter and Christmas but when its hot and humid ~ its okay! LOL!! Well I LOVE everything and of my the bricks ~ EEK!!! LOVE them!